Death awaits the curious! Out along the rim of the galaxy hangs a loose configuration of some 60 stars known as the Faustian Chain. This whorl of sparkling suns is rich in planets and occupies an irregular volume of space some 20 light years in diameter. From an external viewpoint, the Chain presents a colorful display of plasma-streams, luminous nebulae and sparkling pinpoints of light. 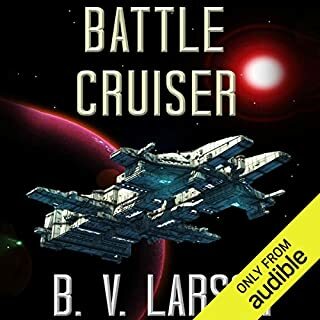 ©2011 B.V. Larson (P)2012 Audible, Inc.
Holy Crapper! Where do I even start! First off, let me explain that I have listened to about 10 Audible Audiobooks, yet this is my first review of one of them. 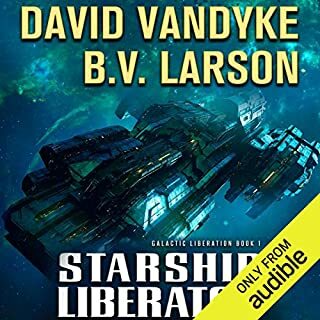 Actually, I found the Star Force series by mistake when trying to search for the sequel to one of the audiobooks that I had read in the past. Well, I am delighted to have found the Star Force series, and although they are all overwhelmingly addictive, I must say that this one is my favorite in the series. Are there drawbacks, yes, but I won't bore you with the details, I always hate when reviewers give you spoilers, just tell me if you like the book or not! Besides, the drawbacks are more like very old, highly abused speedbumps, they only slow you down if you let them. The storyline gets deeper and deeper, and I hate to be cliche, but the plot thickens. And I mean, it's thicker than the nose cone of a Macro cruise ship! Crowe has been busy in Riggs' absence. Earth has better defenses now, but the Macro's are back with a vengeance! The author uses more humor in this latest part of the series as well. 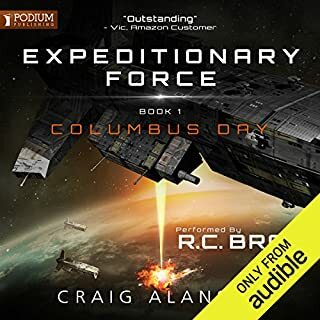 He seems to know exactly when to innoculate the reader with an oddball joke that no one else in the world would appreciate except a die hard Star Force Marine, or a Star Force audiobook listener. Everyone who survived the recent inter-stellar campaign has developed as a character significantly. The action is seemingly non-stop, even when there aren't any lasers firing. Don't even think twice about it, hit the "Add to Cart" button asap. If you liked all of the other books up until now, you will love this one. And if you loved all of the other books up until the release of Conquest, well, need I say more. Good listen! Story picks up where book three left off. 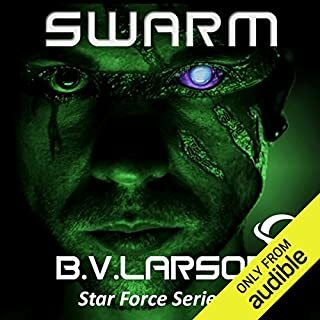 B. V. Larson’s Star Force series is very similar to my favorite Military Sci-Fi author John Ringo and is certainly a must read for Military Sci-Fi fans. The entire book is written in the first person and gets a little old at times. Conquest also compresses a very large scale battle into a relatively short book, leaving very little for additional story or character development. 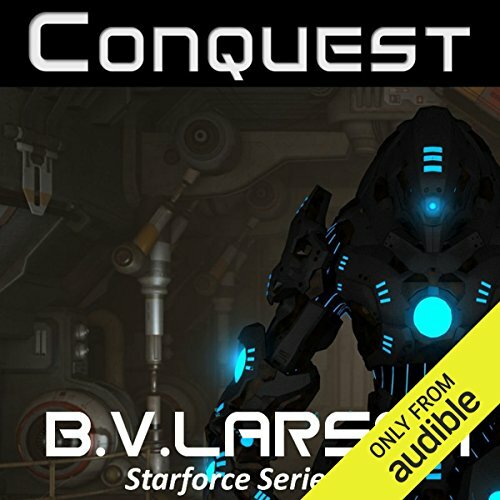 Although constant action is what Military Sci-Fi readers are looking for, and Conquest provides plenty. With the 4th installment, Riggs is finally back on home court and preparing for the eventual round 2 with the macros. The same cast of characters is back with Sandra getting creepier due to the microbiological/nanite combo in her. Crowe is still his "time to flee and hide" self. Much time is spent on defense, followed by a counterattack. At the same time, he is dealing with assassins gunning for him. Riggs also gets to call in any chits he's obtained with alien biota. While the plot is compelling, the pacing well done, and the battle scenes well executed, the overall story suffers from Riggs being forced to carry the whole load. Without Riggs, earth would have been toast long ago and it's not due to a one time superhero feat. Rather, every interaction with aliens of any type always needs Riggs to save the day or at least manage to prevent a catastrophe from developing. Crowe is simply tiresome with his cowardly lion act and Sandra is just plain weird to everyone. Everyone else is extremely formulaic and stereotypical. At the very least, Riggs needs a Mr Spock to figure out what most of the stuff they find actually does. Noticeably absent in this installment is any discussion of the alien race responsible for all this stuff. With a well deserved lull, perhaps Riggs can outfit a more diverse and capable star force (a physicist and biologist would be nice additions). The narration is passable, but unremarkable. For a group that is suppose to represent a swath of earth's population, everyone sounds like they come from a Hollywood studio's caricature department. Excellent chapter/episode. this series continues to impress with each instalment off to read episode 5. give this man a movie contract please. All 5 books in the series so far are very well written and well narrated! Waiting for book 6. What disappointed you about Conquest? "Conquest" was basically the same BS as the other Star Force books, slightly warmed over. Kyle Riggs has the same dysfunctional relationships, the same ridiculous ego clashes, the same idiotic way of making snap judgments based on wishful thinking. His behavior is juvenile at best. Mooning over a pretty fellow officer during a life-and-death battle? Unwillingness to work cooperatively with ANYBODY? Inability to have anything resembling an adult conversation? That's our hero Col. Riggs. It is supposed to be Military Science Fiction, but is fails both the Military and Science Fiction parts. I have already purchased the sequel to "The Mote in God's Eye", titled "The Gripping Hand." Where Rigg's second in command, Lt. Col. Barrera, explained how Riggs was irresponsible, unprofessional, rash, and dangerous. All the things that annoy me endlessly about the character. 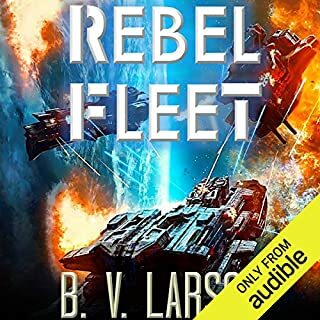 I waited several months after completing the first 3 "Star Force" books before giving this one a listen. This will DEFINITELY BE MY LAST B.V. Larson book! The narrator does a credible job, but the characters are just so ridiculous that I found myself hoping the darn book would end. Fortunately the chapters though many are short so the "plot" such as it is moves along. 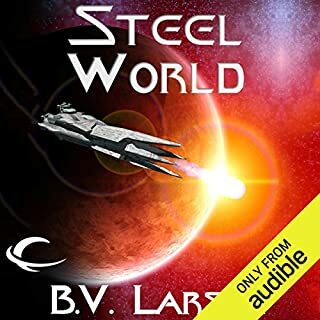 I was looking forward to reading another book in the Starforce series. I enjoyed it until About 1/2 way through when I began to get irritated. The behavior of the characters has become predictable. Riggs will always have the answer, be able to build anything, and go headlong into everything. Crow will always talk big but go off and hide. Sandra is dangerous except when she's not and then she's whining. Marvin will appear when there's a hole in the plot to fill (Jar-Jar Binks comes to mind when I think of Marvin). The only one I still like is Kwon. Sandra is probably the one who ruined this book for me. It's a professional military environment. They are in the middle of a war that could destroy Earth. Here comes Sandra, the Riggs' girl, sticking her nose into everything. I guess the other characters accept her because she is the boss' girlfriend. Riggs continually remarks that he shouldn't have his girlfriend around but there she is. Then there are the arguments. Riggs does something to piss her off. He smirks or says a clever word or two that causes her to suddenly understand and everything is ok. In real life, he'd be sleeping on the couch more often. Come on, Crow, get a pair or shut up. Don't hurt my ships, Riggs or I might take them and go home. Wimpy, wimpy, wimpy. Normally I would look forward to continuing with a science fiction series that allows the reader some escape and entertainment. However I just cannot endure the main character anymore. He is base, petty, and represents the least noble aspects of people. It is just so difficult to like a character who in the middle of a struggle that will effect thousands of lives is more interested in hitting on a woman under his command and hoping that his girlfriend does not catch him. It is also ridiculous to believe that a professor turned farmer is the greatest programmer on earth, the most brilliant military commander, and the one person that should be in a position to alone decide the faith of humanity. I was hoping that after the first few books in the series, the author would try to develop a main character that the reader could like. Unfortunately he did not. And unfortunately I will not continue to read the rest of the series. I originally picked up this first book of this series because there seemed to be a lull in my normal authors putting out books. I have to say I was very happy with the storyline and the narrator. Needless to say, after I finished the first book, imagine my delight in finding three more books of the series already on audible. The books are pretty standard military sci-fi, with the equally standard super-power alien race (in this case robots) and little hope for success. While the story is a bit cliche it is very well told and has its own spins on the classic. Sandra continues to be my least favorite character in the books, I wish she would just get killed off already... but I guess I see her necessity in the story. What next for Colonel Riggs? What did you love best about Conquest? The tireless conquest of Colonel Riggs and the Starforce Marines was phenomenal. As they relentlessly pursue the Macros across the universe I was left feeling almost sorry for them as it seemed they never got much R&R. While all of Earth hung in the balance, and their mission was crucial to survival, I couldn't help but think how heroic the characters were. I wondered, would I have that stamina, that resolve to keep on going? What was one of the most memorable moments of Conquest? Seeing Marvin return from his little adventures of hunting and gathering was a wonderful surprise toward the end. I can see where that character might be going and I am anxious to find out if I'm right. Hands down,Marvin. Boyett did a superb job of personalizing each character and I will be watching for more Boyett narrations. My work productivity slowed due to this great performances of Boyett and the excellent writing of B.V. Larson...couldn't put it down. Also discovered that I need to turn down the volume of my headset so the wife can sleep better. She didn't appreciate the battle for Andros Island at 3 in the morning like I did. Conquest left me anxious for whatever is coming next. Book 4 and atill going strong. Love this series of books. Next here I come. The story has flowed well from the first book to this point. Am looking forward the the next installment. loved it I've all ready spent my credit on the next book in the series. gripping from start to finish. i have a very varied taste in books so sci-fi isnt necessarily my thing, although I do love Douglas Adams. But, this series so far is brilliant. exciting, and a real page turner. I doubt you will be able to finish one book without buying the next in the series. Here's hoping series will pick up from this low point. book 1 was interesting... rest have relied on dull and frustration character interaction that seem to serve as filler rather than story progression. not saying you shouldn't give it a go..just saying it's not my cuppa. Kyle Riggs Still in Great Form! Great story about to start book 5 can't wait to see what else Kyle Riggs comes up with. wavers very little thus far. this part of the book that I found the more interesting of the two acts. either be considering how shapely she is or cavorting in the sack with her. Star Force: Conquest is another excellent addition to the series which is taking shape nicely and as ever we are left with an ending that entices the reader to come back for more.